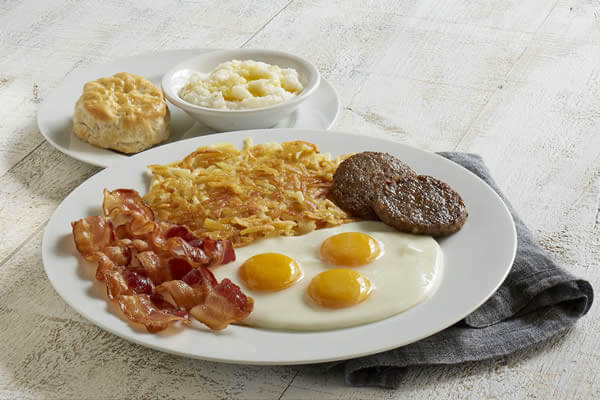 Huddle House is a Southern diner franchise known for our ‘round-the-clock breakfast, Southern hospitality and being the best place to gather in any hometown. After more than 50 years in business, we’ve earned our status as an iconic brand. Our crowd-pleasing menu of favorites is available any time guests want and business thrives in small towns, suburbs and exurbs. The breakfast portion of the menu accounts for more than half of sales, which is awesome because breakfast items generally have higher margins than food typically ordered in other dayparts. 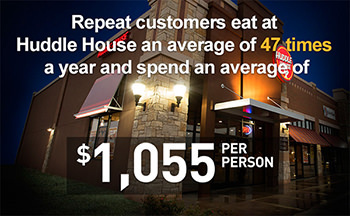 Huddle House offers flexible store types for different investment goals. Contact us to also learn more about a potential low investment turnkey opportunity for restaurant-experienced candidates in select markets. This new look and modernized dining experience retains the charm and familiarity of the brand that guests have loved for decades, while providing big returns for our franchise owners. Our collective buying power, centralized supply and focus on lower-cost, higher-margin breakfast foods also provide a great earnings opportunity for franchise owners. Our smaller market strategy, where land is still plentiful and affordable, allows franchisees to build significant equity through purchasing both land and building. With our smaller footprint, efficient design, and understanding of how to build high customer frequency in smaller, underserved and low-density markets, we make the numbers work by “owning” those under-penetrated markets, as small as 5,000 population. Under CEO Michael Abt’s leadership, we’ve built a team of franchising experts that is dedicated to putting franchisees first. “I truly believe great people are your greatest asset,” says Abt, who was named as one of Nation’s Restaurant News most influential leaders in foodservice in 2016. “We’ve built a tremendous team of top performers who are dedicated to serving our franchise partners. That’s why our sales and profits are better than they’ve been in the history of Huddle House." Huddle House is a 50-year old iconic and traditional brand that is every bit as relevant today as it was when it opened. Huddle House isn’t trendy and therefore doesn’t go out of style. We possess an “evergreen” value proposition: well-priced, well-portioned traditional meals, open kitchen and table service with a smile. We diversify our revenue over four day parts: breakfast, lunch, dinner and late night. We’ve been a favorite diner in the South since the 1960s, and now we’re expanding into new markets across the United States. Aside from typical metropolitan centers, we thrive in the smaller towns that other chains deem too small to service. By creating a “first-to-market” opportunity in these smaller, rural towns, we establish ourselves as the place to go for breakfast, lunch, dinner, late nights and weekends and build fierce brand loyalty with the communities we serve. Huddle House is the “big fish in a small pond,” leaving little available market for the other “big fish” full-service restaurant chains. 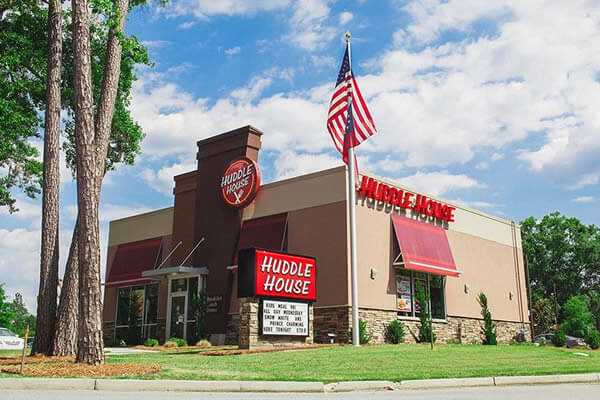 Whether it’s Hazlehurst, Georgia, or Suffolk, Virginia, Huddle House executes a market penetration strategy that has worked well for franchisee investors since 1964. Our multiple restaurant formats and flexible business model provide opportunities for single and multi-unit operators alike. Since our Southern diner franchise works so well in smaller communities, entrepreneurs can establish a hometown gathering place that may have been sorely needed. And with our increasing momentum and the pervasive demand for breakfast, Huddle House is worth considering for any multi-unit owners to establish a foothold in the popular restaurant industry or for a first-time restaurateur looking to get established in the foodservice industry. * Figures reflect the Average Annualized Unit Volume of the top 50% Evolution design franchised restaurants (89 of 177) that were in operation at least 4 months during HHI’s fiscal year from April 30, 2017 to May 1, 2018. Of these 89 restaurants, 35 or 39.3% surpassed this sales level. The Gross Margin is derived from the Net Sales, less the average Food and Paper Cost of 29.4%, Crew Wages of 18.2%, and All Other Payroll Cost of 11.8% for the top 50% Company Owned restaurants (6 of 12) operated by HHI for the past two full years, as of the fiscal year ended May 1, 2018. Some outlets have earned these amounts. There is no assurance you will do as well. See Item 19 of our August 9, 2018 Franchise Disclosure Document for complete details. © 2018 Huddle House, Inc. This does not constitute an offer to sell a franchise. The offer of a franchise can only be made through the delivery of a Franchise Disclosure Document (FDD). Certain states require that we register the FDD in those states. This communication is not directed by us to residents of any of those states. Moreover, we will not offer or sell franchises in those states until we have registered the franchise (or obtained an applicable exemption from registration) and delivered the FDD to the prospective franchisee in compliance with applicable law. Please call Joe Amodio directly at (832) 541-9823. 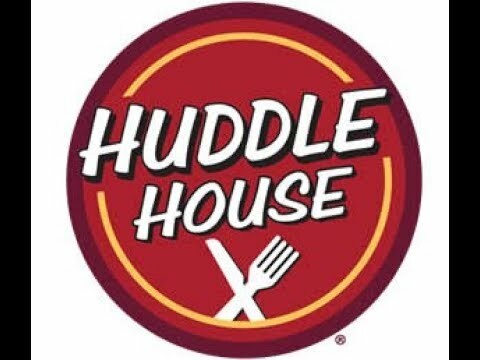 Huddle House is currently accepting inquiries from the following states: Alabama, Arkansas, Delaware, Florida, Georgia, Illinois, Indiana, Kansas, Kentucky, Louisiana, Maryland, Minnesota, Missouri, Nebraska, New Jersey, North Carolina, Ohio, Oklahoma, Pennsylvania, South Carolina, Tennessee, Texas, Virginia, Washington, D.C., West Virginia.